The evolution of an adventure travel company throughout the past 20 years. We do it because it's who we are, it's not a choice, it's our life and we love it. People always ask us how we got into the business, I'm not really sure. For us it was always about doing what we loved, what we were good at and of course the need to make a living. Before the company was founded Philip Osborne a legendary travel guru in the United States since 1960 takes the first group of clients to Lewa Downs Ranch in Kenya meeting the ranch owner David Craig under acacia tree waiting for his guests to arrive. Phil meets Anna Mertz the (later to become a world renown rhino conservationists) who was living at Lewa and financially supports her effort to Save the Rhino which are under heavy pressure from poachers. Lewa which plants the seeds for a new style of safaris. During this pre-Out of Africa time safaris were either with hunting guides in mobile tented camps or in large commercial hotels in the National Parks. Chip - I always wanted to fly, I dreamed of flying, it was the one thing I just had to do in my life. I didn't start flying until I was 29 years old mainly because I never had the money. Knowing my days were numbered as a tennis pro and ski instructor I knew I had to make a move and commit to something and an office job wasn't an option - so flying it was! I had no idea how I was going to pay for it or who would hire a rookie pilot at my age but what the hell. If I was going to do it I had to do it right so I enrolled at Flight Safety one of the most highly regarded Flight Schools in the world located in sunny Vero Beach, Florida. Training alongside soon to be British Airways and Swiss Airways pilots and earned my commercial, multi-engine, IFR and flight instructors pilot licenses, now I just had fly, fly, fly to build up my hours to get a job. After buying a 1957 Cessna 172 (later named Trusty) for $14,000 financed by my not-so-rich Uncle I took on a few student pilots and flew any and everywhere. 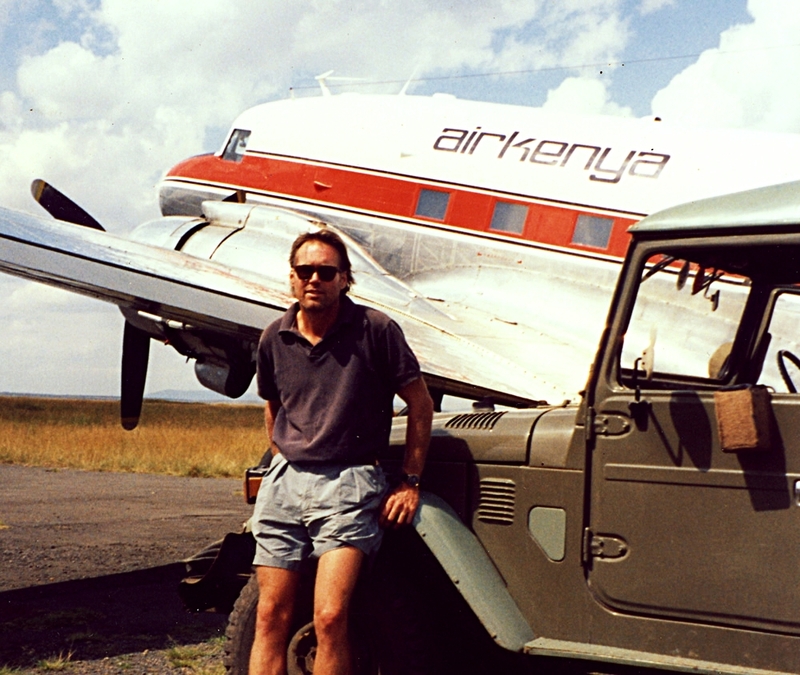 I wanted to be a bush pilot so it was off to Kenya to begin the process of converting his US pilot's certificates to the Kenyan commercial pilot's licenses. Seeing the vast savannas, mountains, lakes, jungles and wildlife from the air it's game over for Chip, he's hooked for life on Africa. The founding of Bush Homes of East Africa, a small group of five privately owned properties located outside of the national parks and games reserves in Kenya. These properties were all owner operated giving access to the most interesting character and personalities in Africa, People who were directly responsible for the conservation projects and protection of the wildlife, employing locals. Chip & Sandy take over the management of Ol Donyo Wuas safari camp in Kenya which had recently burned to the ground in a bush fire. The camp is rebuilt and opened in time for Christmas to the delight of many and over the next years is heralded as one of Africa's best safari lodges. From ashes to glory in 18 months Ol Donyo Wuas is recognized as one of the Top Safari Camps in all of Africa. Helen Fielding the incredible author of Bridget Jones' Diary comes to write an article and knocks it out of the park with her humor and candidness. After years at Ol Donyo Wuas, Chip and Sandy moved to the United States to join Phil Osborne and Christine Mann at Bush Homes that is based in Atlanta, Georgia. With Sandy's upbringing in Zimbabwe and South Africa and her deep knowledge of the safari business in East Africa she leads the company's expansion into Southern Africa. With a proven concept experiencing incredible growth in east and southern Africa the company expands the concept with the Outback Stations Australia and the Estancias of Argentina. Both destinations are interested in transforming large private ranches into nature-based destinations featuring the authentic lifestyles, history and wildlife of these spectacular properties. With this expansion the company name is changed to Uncharted Outposts, a Safari & Travel Company. After a couple years of working on the business model in Australia Drew Kluska a former manager at Lewa Downs and great friend of Chip's invites him to host a conference with 20 of Australia's station owners in hope of forming an association like Bush Homes in Kenya. After a couple days of hard work, brainstorming and figuring out the next steps one of the great parties of all time was had. Ango Bango hosted the party of the century and it got weird as it usually does when you have these larger than life outback characters not to mention the two-headed Tasmanians. As a consequence of the attacks of September 11, 2001 and it's devastating effect on tourism in Africa the company takes a hard look at other destinations and opportunities around the world. Chip is contracted by the Inter-American Development Bank (IDB) to help them with the initial plan for developing indigenous community-owned ecolodges across Central America. After year of supporting and working with conservation organizations in Africa we start TUSK (USA) a dynamic, pioneering organization in community development, wildlife protection and environmental education programs across Africa. We donate our time, resources, staff and office space to develop TUSK into a successful and highly productive charitable cause. The company relocates to Santa Fe, New Mexico. It's a natural fit for Uncharted Outposts, a company whose values are based in the authentic, cultural diversity and beautiful natural surroundings. With ambitions of developing an safari style tourism is New Mexico we were awarded by the New Mexico Tourism Department a 2 year contract to initiate the develop of eco-tourism throughout the state. We targeted Ted Turner's vast ranches in New Mexico as well as Taos, Chama as well as the Federal and Native lands. It's a lot to do about nothing. On their first official visit to the USA as a married couple William & Kate kindly host a beautiful at Steve Tisch's house in Beverly Hills. In attendance were Michael Isner CEO of Disney, Giancarlos the founder & CEO of Guess Jeans, Reese Witherspoon and husband, and various Hollywood types wanting to meet Willie & Kate. Having worked closely with our friends at Outside Magazine also located in Santa Fe we decide to combine their marketing power with our tour operator expertise to form Outside GO, the adventure travel division of the Outside brand. The partnership is a match made in heaven, two like-minded companies driven to inspire people to live life to it fullest and making the world a better place! Stay tuned, with new destination coming on board and amazing new experience being offered it worth checking out our site weekly. Our philosophy of not accepting the status quo as good enough and determined to reinventing the adventure travel industry will will be evolving continuously for the sole purpose of providing the best service to our clients.